A photograph of the State Soldiers Home graduating class at Dodge City, Kansas. 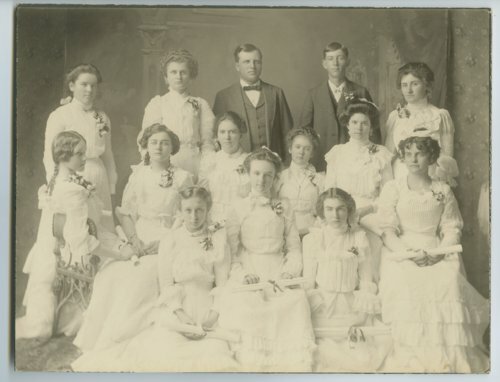 Top row: Bessie Powers, Susie Evans, Professor Woodbury, Humphry Sughrue, Jennie Graver. Middle row: Neada McCaffry, Bessie Boyd, Pearl Malcolm, Amelia Johnson, Serena Barr, Glen Roth. Bottom row: Ethel Wynans, Fay Thompson, Jennie Shaffer.